If you are planning on hosting a holiday brunch or any get-together where both adults and children will be attending, I have a fun idea for a holiday centerpiece for you. This idea uses classic Rice Krispies Treats and Rice Krispies cereal. You may have everything you need around the house to create this centerpiece already. It is pretty simple to make. First of all you will need to make at least one batch of treats. You can follow this link to find the Classic Rice Krispies Treats Recipe, but you can always find it on one of the panels on a box of Kellogg's Rice Krispies Cereal. The treats will need to be cut into cubes, so the size of your pan and the number of guests you are expecting will determine how many batches of treats you will need to make. 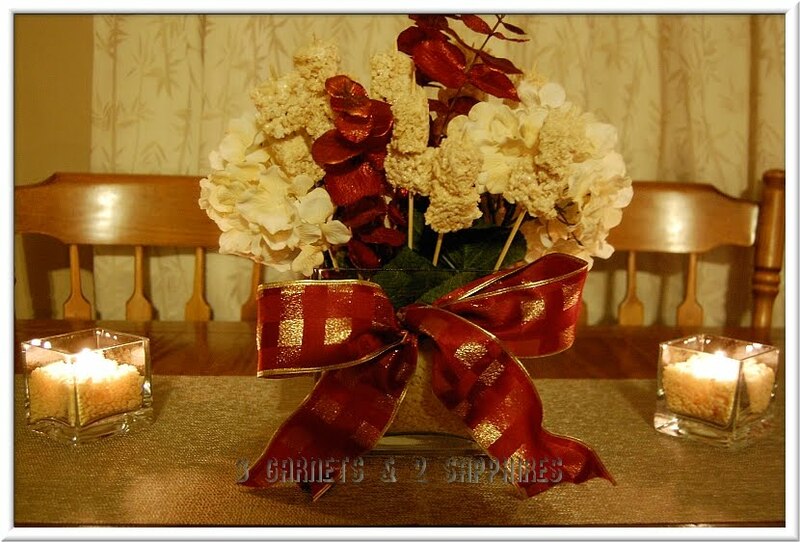 I decided to go with the classic treats because the colors suited my centerpiece design. I did consider crushing candy canes and mixing them into the cereal, but was worried my centerpiece would look less elegant. You can experiment as much as you like. In the past, I have made Rice Krispies Treats with chocolate-covered pretzels and some with chocolate-covered peanuts, both of which seemed to have been a hit. Step #1. 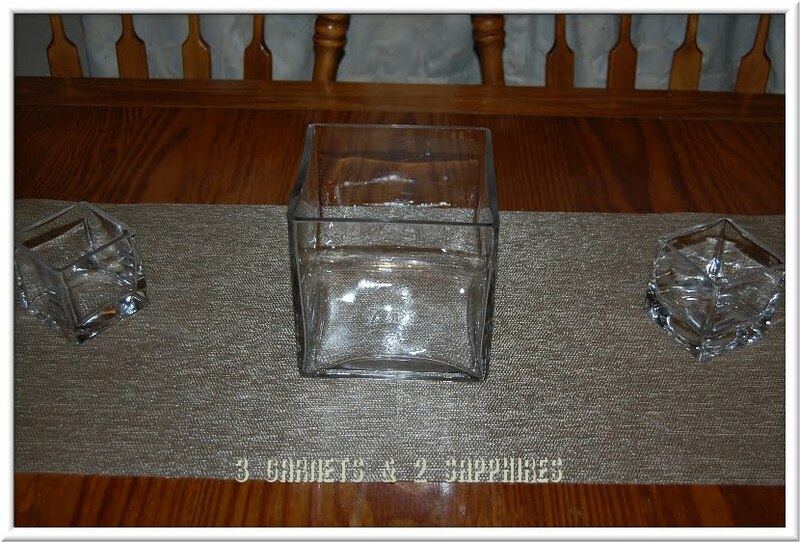 Place your vase and two votive cup holders on top of your table runner, with the vase centered and one votive cup on each side. I could not find a runner that I liked well enough, so I bought these two placemats at Target and just placed them together side-by-side. Step #2. 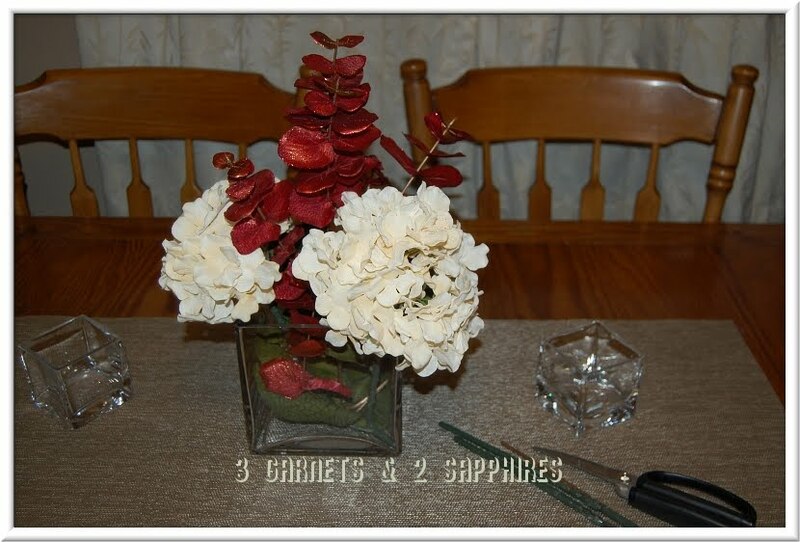 Cut the stems of your flowers so that most of the arrangement is about 3 or 4 inches shorter than the skewers you purchased. Then arrange the flowers to your liking in the vase. Barbecue-length skewers would have allowed me to use a taller vase and to create an even grander centerpiece, but they are out-of-season where I live. Step #3. Next fill the vase about 2/3 of the way with Rice Krispies Cereal, making sure the cereal fills in around the stems and leaves. Step #4. Fill the two votive cups about halfway with Rice Krispies Cereal. 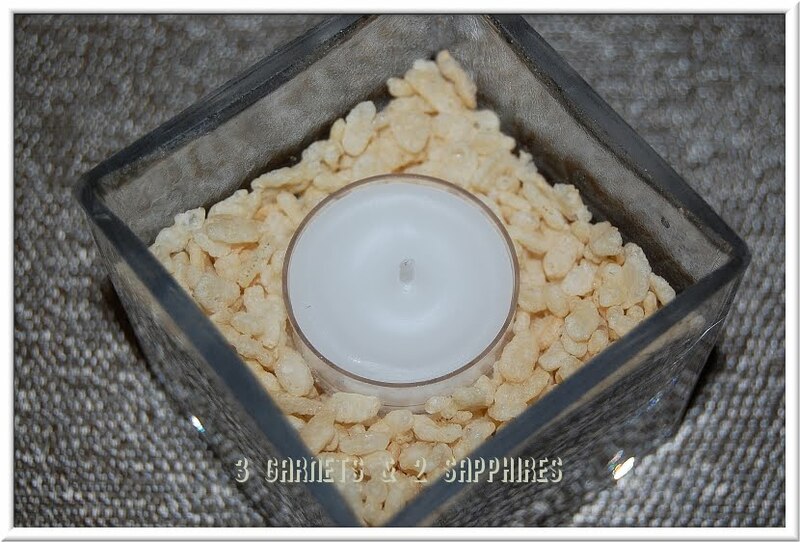 Then place one unscented tealight in each of the cups, making sure they are centered and nestled into the cereal. Step #5. 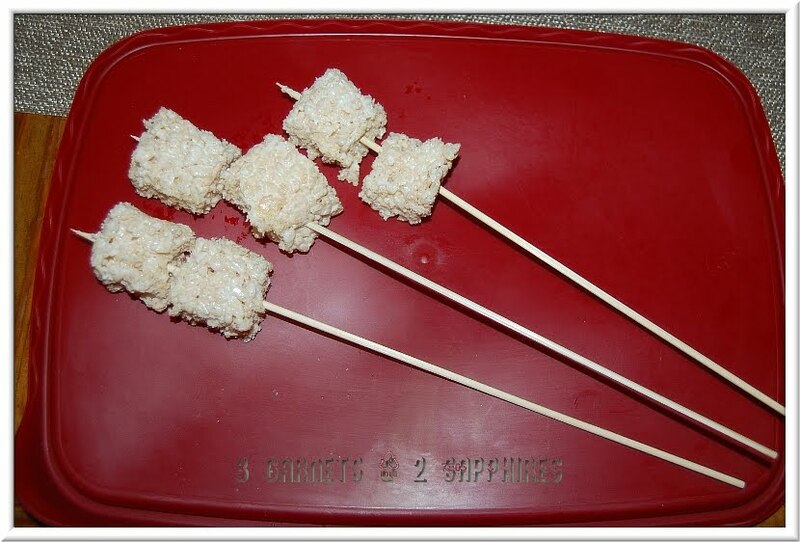 If you have not already, cut your Rice Krispies Treats into cubes. Then skewer 2 or more treats with the wooden skewers, making sure that the treats stay near the top end. How many treats you can put on each skewer depends on how tall your arrangement is. Step #6. 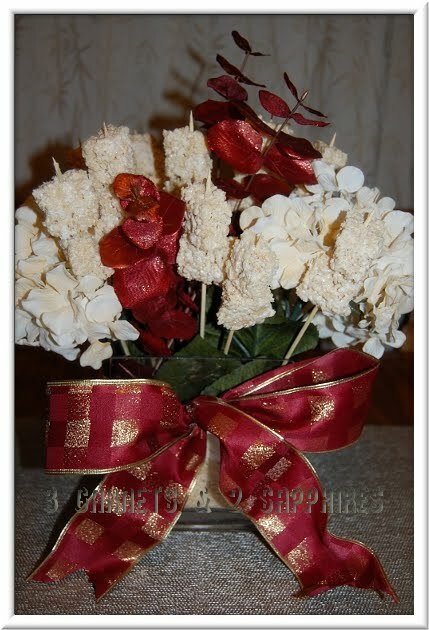 Push the bottom ends of the skewers into the rice cereal within the vase, making sure not to overshadow the flowers. Step #7. 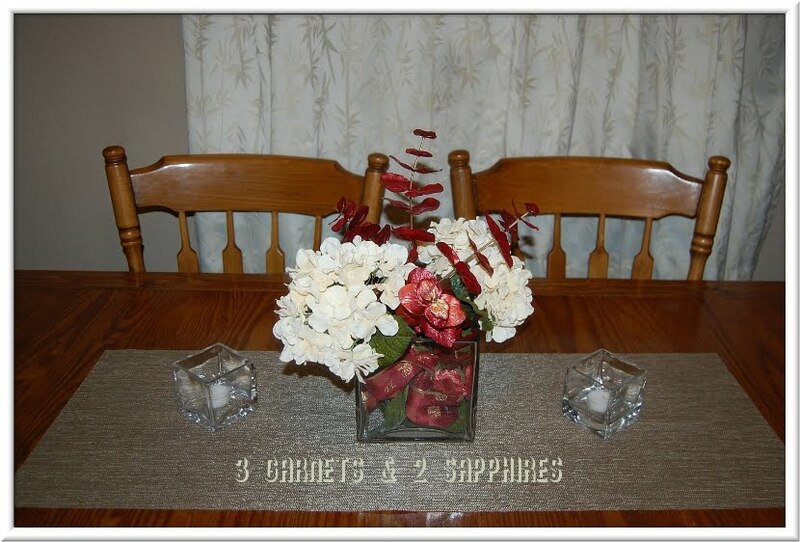 Tie the wired holiday ribbon around the vase and form a large bow on the front. If you would like to, you can dovetail the ends of your ribbon. Our Final Results . . . 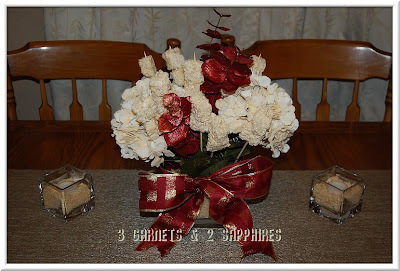 Your centerpiece may come out drastically different from mine, depending on the components you choose to use. That is the wonderful thing about this project. 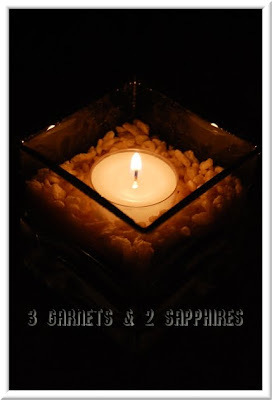 You can create it to suit your own taste and decor. 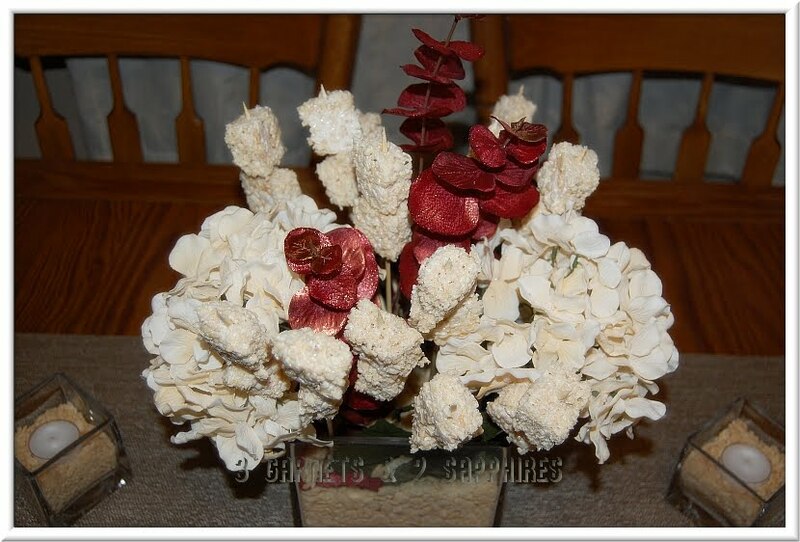 After the guests have enjoyed all the skewers of Rice Krispies Treats, you will still have an attractive centerpiece leftover. 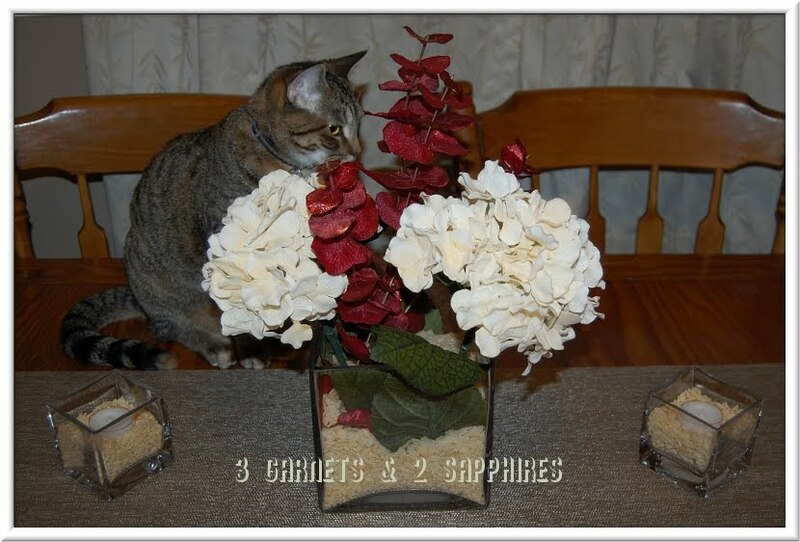 When the event has concluded, you can empty out the cereal and either keep the bow or remove it and swirl the ribbon inside the vase around the stems and leaves. 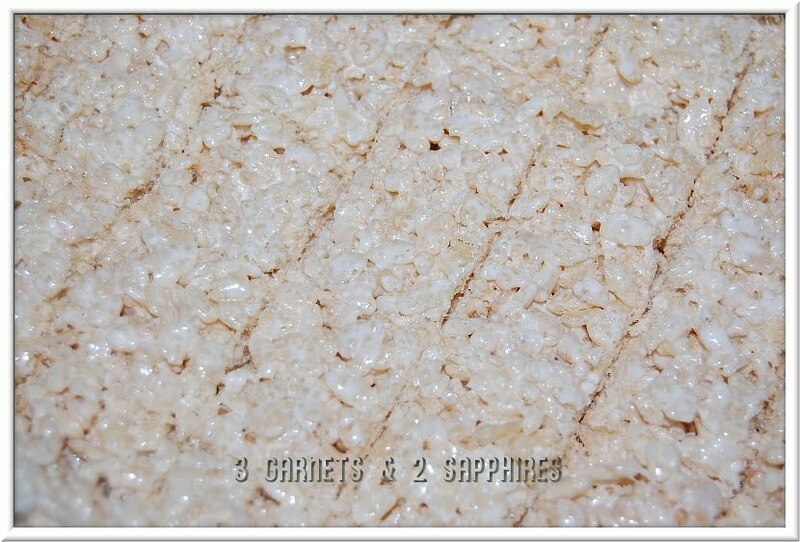 If you would like to add a little color and spice to your Rice Krispies Treats, here is a quick and easy recipe . . . Step 1. In a large saucepan or skillet, melt the butter or margarine over low heat. Step 2. Add mini marshmallows and stir continuously until completely melted and blended with butter. Step 3. Add Rice Krispies cereal and then the crushed cinnamon candy. Step 4. Remove the pan from heat. Then stir until the cereal and candy mixture are completely coated with the melted marshmallow. This project was inspired by a challenge put before me by TheMotherhood.com . 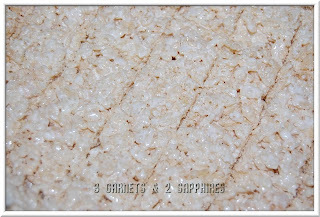 You can see what other participants have come up with by visiting TheMotherhood's Rice Krispies Recipe Box Circle, Kellogg's Rice Krispies on Facebook and following Rice Krispies on Twitter along with the hashtag #RiceKrispies. I received payment for my participation in this campaign sponsored by TheMotherhood, who also provided the funds for supplies, the cereal, and a contest prize on behalf of Kellogg's Rice Krispies Brand Cereal. One lucky reader will receive a $100 Visa Gift Card. This giveaway is open to U.S. entries only. You do not need to be a blogger to enter, but you must have a valid email address and be age 18 years or older. If you enter anonymously and do not include a valid email address in your comment entries, I will not be able to notify you should you win this random drawing. Winner must not have won the same prize for this campaign on a different website. Leave a comment telling me what special ingredient you would add to the Classic Rice Krispies Treats recipe to make them more fun for the holidays. You MUST do this to be eligible to win this contest. 3) For 10 extra entries, register for an All K-Pass to access all the Kellogg's brand websites. Then come back here and leave TEN separate comments telling me you did.
. Then leave a separate comment for each with the link to your Twitter or Facebook profile.